The upgraded version of Mazda's best-selling model worldwide, the Mazda3, is now on sale from £13,495 (on-the-road), which includes a £2,300 saving (1.6 TS model). Made exclusively in Japan, the five-door hatchback has more muscular visual appeal with a new face, new rear bumper and new twist-spoke alloy wheels. Inside, there are new materials and colours, improved ease-of-use for the driver, new equipment and a quieter cabin for all to enjoy. Fuel economy across the range is enhanced thanks to the new model's refined aerodynamics which cut Cd to just 0.29. Handling is improved with the upgraded Mazda3 delivering a more consistent and linear driving feel. New models include two Sport derivatives and new equipment includes a gear-shift indicator (excludes 2.3-litre MZR DISI Turbo engine). When upgrading the Mazda3, the company's engineers fine-tuned the suspension and steering to deliver more‘Toitsukan' -more linear steering feel for more control and assured predictability, plus a smoother ride and improved refinement. The super-efficient Mazda 1.6-litre diesel, available in six versions of Mazda3, is a lightweight, compact and extremely efficient unit. On the inside, upgraded Mazda3 features updates to create a more stylish interior that retains its functionality and is even easier to use. Designers focused on reducing the amount of eye-movement required to use the car's onboard systems from behind the wheel. They replaced the previous silver colour of the lower dashboard console with black, and ringed the dials and controls most used by the driver in satin-polish silver that's easier to see. 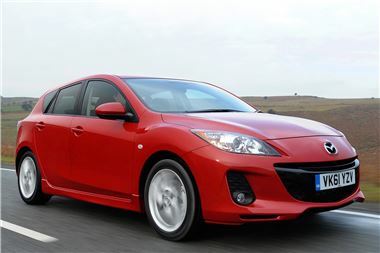 Every upgraded Mazda3 has a generous standard specification within its price band. The entry-level S model has manual air-conditioning and electric front windows, TS models have dual-zone climate control, TS2 specification adds a heated windscreen and integrated Bluetooth® hands-free system, Sport derivatives are fitted with 17-inch alloy wheels and a Bose® audio system with 10 speakers, and Sport Nav models have a fully integrated, satellite navigation system. From introduction, two Launch Edition Mazda3 Tamura models are available, representing exceptional value with a sports styling pack, front fog lights and unique 17-inch black gloss diamond cut alloy wheels. Available in a choice of four colours including: Aluminium Silver Metallic, Autumn Bronze Mica, Black Mica and Crystal White Pearlescent. Mazda dealers are currently offering Mazda3 buyers three finance packages with 0%, 3.9% and 6.9% APR finance, 0%-to-50% minimum deposit and up to 36 months repayment. Offers are for retail sales only on vehicles registered until 31 March 2012. Finance subject to status. Terms and conditions apply. Applicants must be 18 or over. Guarantees/Indemnities may be required. Mazda Financial Services RH1 1SR. NB ‘On the road' prices include 20.0% VAT, number plates, delivery, 12 months road fund licence, first registration fee, 3 year or 60,000 mile warranty and 3 years European Roadside Assistance. All models are available with free 7-day drive away insurance.